Garden Ornaments? Garden Art or Tackville. For godsake give me Garden Beet’s hanging spinner thingymebob. Anyone seen those spinners in the garden centres that are more than slightly beyond tacky? The idea is great – reflect a bit of light and create some movement. Heavens to betsy people have even searched for them on my site. Baa bow – sorry guys. BUT i have an alternative – not as cheap but their is loads of arrangement and placement fun. 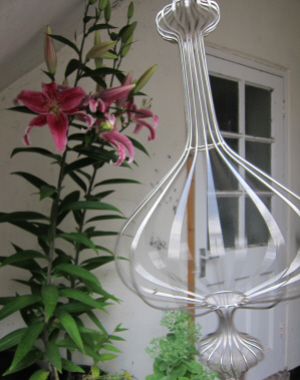 Its made from stainless steel and you can open them up and place a plant inside. 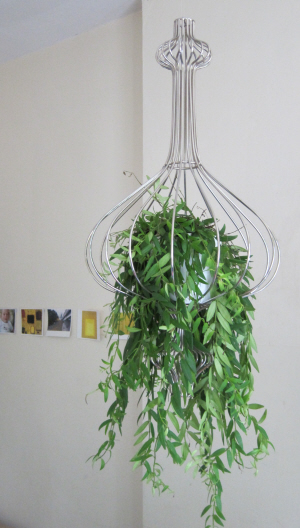 A true contemporary hanging basket. Now its £80 – but its versatile and it will last. Loads of spinning fun. Plus it moves in the wind. Its hypnotic. I promise. I have been watching it most of the day. Maybe you need to go cheaper – what about a traditional garden gazing globe. Very popular with the Victorians. 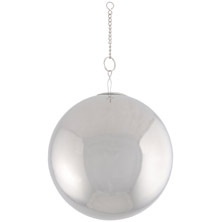 It spins, reflects and are great garden art ornaments with a capital GO. Its only £21.99. Relax, ornamentation is becoming acceptable. The architects have said so. There is tacky and there is tacky. Garden Beet is treading a fine line – its up to you to place ornaments with style. Unlike the RHS if you want gnomes and rainbows we think yah yah – go on then – ….as long as production has some eco ethical bent – and can you make the placement interesting? Previous articleGarden wall art can make the outdoors snug. And so can vertical gardens. Next articleIf vertical gardens make dense living attractive does it matter if water consumption is reduced or increased?